The Junior Clever Lite Rollator Walker with Wheels in blue by Drive Medical allows individuals to be seated or to use it as a traditional walker by raising the seat to step inside the frame. Front wheels can be set in either “swivel” or “fixed” position. Special loop lock made of internal aluminum casting operates easily and ensures safety. Sturdy 1" diameter anodized, extruded, aluminum construction. Comes with flip up seat with built in carry handle. 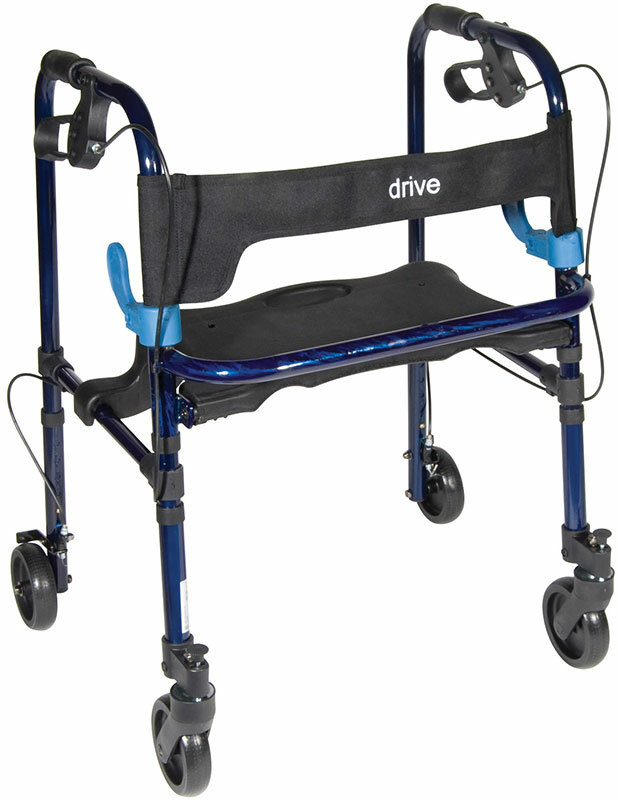 Allows individual to be seated or use as traditional walker by raising seat to step inside the frame. Easily folds with dual lever side paddle release. Soft, flexible backrest provides comfort and stability while seated. Attractive blue finish. Limited Lifetime Warranty. Lifetime Warranty on brake cable.